Investment industry practitioners and academics are increasingly analyzing the financial and economic reasons investment advisors should offer clients investment strategies that are void of fossil fuel extractors, fossil-burning utilities, pipelines and oil and gas industry service providers. 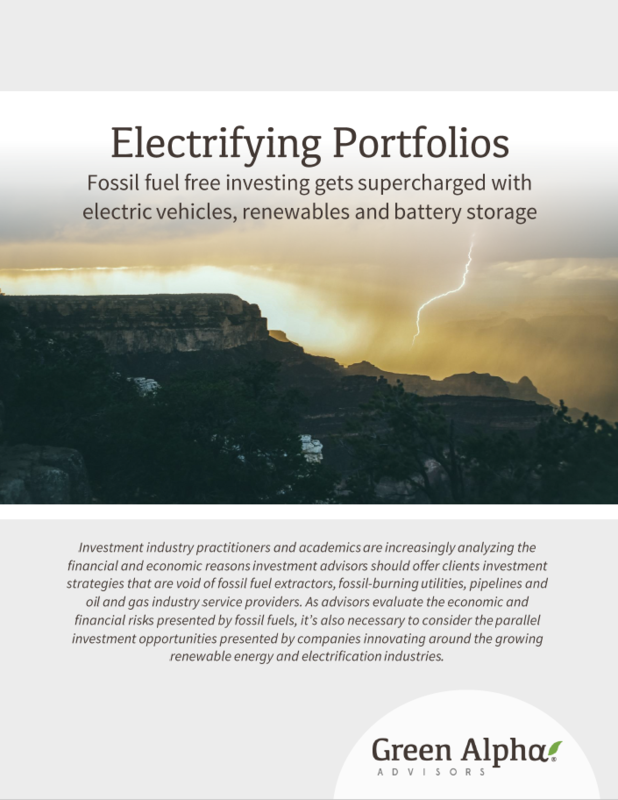 As advisors evaluate the economic and financial risks presented by fossil fuels, it’s also necessary to consider the parallel investment opportunities presented by companies innovating around the growing renewable energy and electrification industries. Transportation Sector is Shifting Energy Demand: Innovation, growing consumer demand and international policy changes are driving explosive growth in electric vehicle (EV) production, which is leading to decreasing fossil fuel demand. As overall electricity demand continues to increase and technology rapidly develops, renewables are gaining market share. Efficient Energy Generation and Storage: Unlike commodity-based fossil fuels that become more expensive as demand increases, renewable energies and battery storage are tech-driven. Following Moore’s Law and Wright’s Law, the technologies become more efficient and cheaper as production increases, so cost competitiveness will only continue to improve.